"Sephiroth" redirects here. For the Final Fantasy VII character, see Sephiroth (Final Fantasy). Sefirot (/sfɪˈroʊt/, /ˈsfɪroʊt/; Hebrew: סְפִירוֹת səphîrôṯ), meaning emanations, are the 10 attributes/emanations in Kabbalah, through which Ein Sof (The Infinite) reveals Itself and continuously creates both the physical realm and the chain of higher metaphysical realms (Seder hishtalshelus). The term is alternatively transliterated into English as sephirot/sephiroth, singular sefirah/sephirah etc. 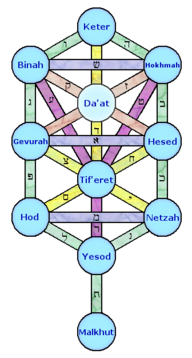 Alternative configurations of the sefirot are given by different schools in the historical development of Kabbalah, with each articulating different spiritual aspects. The tradition of enumerating 10 is stated in the Sefer Yetzirah, "Ten sefirot of nothingness, ten and not nine, ten and not eleven". As altogether eleven sefirot are listed across the different schemes, two (Keter and Da'at) are seen as unconscious and conscious manifestations of the same principle, conserving the ten categories. The sefirot are described as channels of Divine creative life force or consciousness through which the unknowable Divine essence is revealed to mankind. The first sefirah, Keter, describes the Divine superconscious Will that is beyond conscious intellect. The next three sefirot (Chokhmah, Binah and Da'at) describe three levels of conscious Divine Intellect. The seven subsequent sefirot (Chesed, Gevurah, Tiferet, Netzach, Hod, Yesod and Malkuth) describe the primary and secondary conscious Divine Emotions. Two sefirot (Binah and Malkuth) are feminine, as the female principle in Kabbalah describes a vessel that receives the outward male light, then inwardly nurtures and gives birth to lower sefirot. Corresponding to this is the Female Divine Presence (Hebrew: שְׁכִינָה‎, Shekhinah). Kabbalah sees the human soul as mirroring the Divine (after Genesis 1:27, "God created man in His own image, in the image of God He created him, male and female He created them"), and more widely, all creations as reflections of their life source in the sefirot. Therefore, the sefirot also describe the spiritual life of man, and constitute the conceptual paradigm in Kabbalah for understanding everything. This relationship between the soul of man and the Divine, gives Kabbalah one of its two central metaphors in describing Divinity, alongside the other Ohr (light) metaphor. However, Kabbalah repeatedly stresses the need to avoid all corporeal interpretation. Through this, the sefirot are related to the structure of the body and are reformed into partzufim (personas). Underlying the structural purpose of each sefirah is a hidden motivational force which is understood best by comparison with a corresponding psychological state in human spiritual experience. In Hasidic philosophy, which has sought to internalise the experience of Jewish mysticism into daily inspiration (devekut), this inner life of the sefirot is explored, and the role they play in man's service of God in this world. The Ein Sof (lit: without end) is an important concept in Jewish Kabbalah. Generally translated as ‘infinity’ and ‘endless,’ the Ein Sof represents the formless state of the universe before the self-materialization of God. In other words, the Ein Sof is God before He decided to become God as we now know Him. The Sefirot are divine emanations that come from the Ein Sof in a manner often described as a flame. The Sefirot emanate from above to below. As the first Sefira is closest to Ein Sof, it is the least comprehensible to the human mind, while in turn the last is the best understood because it is closest to the material world that humanity dwells on. Sefirot (ספירות, sfirot, singular ספירה sfirɔ), literally means "counting, enumeration", but early Kabbalists presented a number of other etymological possibilities from the same Hebrew root including: sefer ("text" - ספר), sippur ("recounting a story" - סיפור), sappir ("sapphire" - ספיר, "brilliance", "luminary"), sfar ("boundary" - ספר), and sofer, or safra ("scribe" - ספרא, סופר). The term sefirah thus has complex connotations within Kabbalah. The original reference to the sefirot is found in the ancient Kabbalistic text of Sefer Yetzirah, "The Book of Formation", attributed to the first Jewish Patriarch, Abraham. However, the names of the sefirot as given in later Kabbalah are not specified there. Further references to the sefirot, now with their later-accepted names, are elaborated on in the medieval Kabbalistic text of the Zohar, which is one of the core texts of Kabbalah. The sefirot are ten emanations, or illuminations of God's Infinite Light as it manifests in Creation. As revelations of the Creator's Will (רצון rɔṣon), the sefirot should not be understood as ten different "gods" but as ten different channels through which the one God reveals his will. In later Jewish literature, the ten sefirot refer either to the ten manifestations of God; the ten powers or faculties of the soul; or the ten structural forces of nature. In Cordoveran Kabbalah, the forces of creation are considered as autonomous forces that evolve linearly from one another. By contrast, in Lurean or Lurianic Kabbalah (the Kabbalah of Isaac Luria), the sefirot are perceived as a constellation of forces in active dialogue with one another at every stage of that evolution. Luria described the sefirot as complex and dynamically interacting entities known as partzufim, each with its own symbolically human-like persona. Keter, the Crown, is the first sefirah. It is the superconscious intermediary between God and the other, conscious sefirot. Three different levels, or "heads", are identified within Keter. In some contexts, the highest level of Keter is called "The unknowable head", The second level is "the head of nothingness" (reisha d'ayin) and the third level is "the long head" (reisha d'arich). These three heads correspond to the superconscious levels of faith, pleasure and will in the soul. In its early 12th-century dissemination, Kabbalah received criticism from some rabbis who adhered to Jewish philosophy, for its alleged introduction of multiplicity into Jewish monotheism. The seeming plurality of the One God is a result of the spiritual evolution of God's light, which introduced a multiplicity of emanations from the one infinite Divine essence. This was necessary due to the inability of mankind to exist in God's infinite presence. God does not change; rather, it is our ability to perceive His emanations that is modified. This is stressed in Kabbalah in order to avoid heretical notions of any plurality in the Godhead. One parable to explain this is the difference between the "Ma'Ohr" ("Luminary"-Divine essence) and the "Ohr" ("Light") He emanates, like the difference between the single body of the sun and the multiple rays of sunlight that illuminate a room. In Kabbalah, there is a direct correspondence between the Hebrew name of any spiritual or physical phenomenon and its manifestations in the mundane world. The Hebrew name represents the unique essence of the object. This reflects the belief that the universe is created through the metaphorical speech of God, as stated in the first chapter of Genesis. Kabbalah expounds on the names of the sefirot and their nuances, including their gematria (numerical values), in order to reach an understanding of these emanations of God's essence. Super-conscious 1 Keter - "Crown"
Conscious intellect 2 Chokhmah - "Wisdom"
In the subsequent 16th-century transcendent Kabbalistic scheme of Isaac Luria, the sefirot are usually listed by omitting Keter and including Da'at (the conscious manifestation of the superconscious Keter. This difference of opinion reflects an earlier Medieval debate regarding whether Keter is the first sefirah, or the Ohr Ein Sof (Infinite light) itself. Luria includes Keter in the list only in relation to the inner light of the sefirot. In his usual list of the sefirot as formed attributes (vessels), Keter is considered too lofty to include: In this scheme, the sefirot are depicted as lying across three parallel vertical axes. Conscious intellect 2 Binah - "Understanding"
(Secondary emotions) 8 Hod- "Glory"
Keter - "Crown": Divine Will to create/Infinite Light of the Creator/the Hebrew name of God "Ehyeh Asher Ehyeh-I Am that I Am"
Da'at - "Knowledge": Central state of unity of the 10 sefirot, also called the Tree of Life. Malkuth - "Kingship": Female vessel for the pregnant nurturing of the male lights of the emotional sefirot into action/becomes the Keter Will source for any subsequent lower level in Creation/accomplishment/realization of the Divine Plan. The first development that enabled the sefirot to unite in cooperation was the interinclusion within each of them of a further subset of the 10 sefirot, bringing them to a total of one hundred inter-included sefirot. In Kabbalistic interpretation, the seven emotive sefirot similarly inter-include to form 49 (seven times seven) emotional states. So, for example, Chesed contains Chesed within Chesed (loving-kindness within loving-kindness), Gevurah within Chesed (might within loving-kindness) etc. until Malkuth within Chesed (kingdom within loving-kindness). Likewise, there is Chesed within Gevurah (loving-kindness within might, typified by a restriction performed out of love, like a father punishing a child)), Gevurah within Gevurah (might within might), etc. until Malkuth within Gevurah (kingdom within might) and so on, until the 49th level, Malkuth within Malkuth (kingdom within kingdom). This is the Kabbalistic interpretation of the mitzvah (Jewish observance) of Counting of the Omer between the festivals of Passover and Shavuot. Passover commemorates the Exodus from Egypt (in Hebrew, Mitzrayim מצרים, meaning "limitations"), which represents the unrectified level of the psyche, which we must escape through our daily spiritual development. Shavuot commemorates the receiving of the Torah on Mount Sinai. During this 49 day period Kabbalah teaches the benefit of focusing on the aspect of the 49 inter-included sefirot that is related to each particular day of the Omer. On each day of the Omer, a person would examine each of their spiritual qualities, as a rectification process of Teshuva (Return to God), as preparation for reliving the acceptance of the Torah on Shavuot. Two alternative spiritual arrangements for describing the sefirot are given, metaphorically described as "Circles" and "Upright". Their origins come from Medieval Kabbalah and the Zohar. In later, 16th-century Lurianic Kabbalah, they become systemised as two successive stages in the evolution of the sefirot, during the primordial cosmic evolution of Creation. This evolution is central to the metaphysical process of tikkun (fixing) in the doctrines of Isaac Luria. Metaphorical representation of the Five Worlds, with the 10 sefirot radiating in each, as successively smaller Iggulim "concentric circles"
One diagrammatic representation depicts the sefirot metaphorically as successively smaller concentric circles, radiating inwards from the surrounding Divine Omnipresence. The Four Worlds of the seder hishtalshelus ("Chain of Progression"), or with the addition of the highest Fifth World (Adam Kadmon), can be depicted in this diagram, starting with the highest and proceeding towards the centre of the circle to our lowest, physical realm. In each World the 10 sefirot radiate, as 10 successive steps in the downward chain of flow towards the next, lower realm. This depiction shows the successive nature of each of the 10 sefirot, as a downward chain, each more removed from Divine consciousness. The surrounding space in the diagram is the Infinite Divine reality (Ein Sof). The outermost circle in the teachings of Lurianic kabbalah is the "space" made by the Tzimtzum in which Creation unfolds. Each successive World is progressively further removed from Divine revelation, a metaphorically smaller, more constricted circle. Emanation in each World proceeds down the 10 sefirot, with the last sefirah (Malchut-Actualisation of the Divine plan) of one World becoming, and being shared as, the first sefirah (Keter-The Divine Will) of the next, lower realm. The vertical line into the centre of the circle represents the path of downward emanation and constriction, from the initial first Ohr (light) of the "Kav" (Ray) in Lurianic doctrine. The most important and well known scheme of depicting the sefirot arranges them as a tree with 3 columns. The Right column represents the spiritual force of expansion. The Left represents its opposite, restriction. The Middle column is the balance and synthesis between these opposing tendencies. The connecting lines in the diagram show the specific connections of spiritual flow between the sefirot, the "22 Connecting Paths", and correspond to the spiritual channels of the 22 letters of the Hebrew alphabet. Kabbalah sees the Hebrew letters as channels of spiritual life force. This derives from the account in Genesis of the Creation of the World, where Creation takes place through 10 Hebrew "Sayings" of God ("Let there be.."). In Kabbalistic theology, these letters remain the immanent spiritual forces that constantly recreate all existence. The paths divide into 3 Categories, shown in this diagram by their different colours, corresponding to the 3 types of letter. An alternate depiction of the sefirot is in the form of a man. The first sefira represents the head, the next three represent the cavities of the brain, the fourth and fifth sefirot represent the arms, the sixth sefira is the torso, the seventh and eighth are the legs, the ninth is the sexual organ, and the tenth is the all-embracing totality of this image. This man is also divided into two, with the right column being made up of the male sefirot and the left, the female sefirot. Kabbalah, the central system in Jewish mysticism, uses subtle anthropomorphic analogies and metaphors to describe God in Judaism, both the God-world relationship, and the inner nature of the Divine. These include the metaphor of the soul-body relationship, the functions of human soul-powers, the configuration of human bodily form, and male-female influences in the Divine. Kabbalists repeatedly warn and stress the need to divorce their notions from any corporality, dualism, plurality, or spatial and temporal connotations. As "the Torah speaks in the language of Man", the empirical terms are necessarily imposed upon human experience in this world. Once the analogy is described, its limitations are then related to, stripping the kernel of its husk, to arrive at a truer conception. Nonetheless, Kabbalists carefully chose their terminology to denote subtle connotations and profound relationships in the Divine spiritual influences. More accurately, as they see the emanation of the Material world from the Spiritual realms, the analogous anthropomorphisms and material metaphors themselves derive through cause and effect from their precise root analogies on High. Describing the material world Below in general, and humans in particular, as created in the "image" of the world Above is not restricted in Rabbinic Judaism to Kabbalah, but abounds more widely in Biblical, Midrashic, Talmudic and philosophical literature. Kabbalah extends the Man-metaphor more radically to anthropomorphise particular Divine manifestations on high, while repeatedly stressing the need to divest analogies from impure materialistic corporality. Classical "proof texts" on which it bases its approach include, "From my flesh I envisage God", and the Rabbinic analogy " As the soul permeates the whole body...sees but is not seen...sustains the whole body...is pure...abides in the innermost precincts...is unique in the body...does not eat and drink...no man knows where its place is...so the Holy One, Blessed is He..." Together with the metaphor of Light, the Man-metaphor is central in Kabbalah. Nonetheless, it too has its limitations, needs qualification, and breaks down if taken as a literal, corporeal comparison. Its limitations include the effect of the body on the soul, while the World effects no change in God; and the distinct, separate origins of the soul and the body, while in relation to God's Omnipresence, especially in its acosmic Hasidic development, all Creation is nullified in its source. The Yosher-Upright configuration of the sefirot arranges the 10 sefirot into a Partzuf interrelationship, where each sefirah relates and mediates the influence of the others. This metaphor for Divine interrelationships on High is arranged in the schematic relationship of a human soul, because alone amongst all Creation, Adam-Man is held to encapsulate all harmonized forces, while animals and angels embody only singular instinctive drives. The significance of this, as well as the full meaning of the Partzufim reconfiguration of the sefirot, emerges only in 16th century Lurianic Kabbalah, where the Yosher-Upright arrangement, the Partzufim and the souls of Israel represent the secondary World of Tikun-Rectification, while angels, animals and the root origins above of the Nations of the World embody the primordial World of Tohu-Chaos. Lurianic Kabbalah applies the verse, "God created man in His own image, in the image of God He created him, male and female He created them" to this reconfigured Tikun-Yosher arrangement. In the Yosher scheme, Divine principles are described through the soul faculties of Man, with Binah-Understanding and Malkuth-Kingship-Shechinah-Indwelling Divine Presence, encapsulating the Divine Feminine in Creation, the principle of receiving, nurturing and pregnant internalization. For the sake of the union of the Holy One, Blessed Be He, and His Shechinah; to unite the name Yud and Hei, with Vav and Hei in the name of all Israel. The four Hebrew letters of God's essential Divine name (known as the Tetragrammaton) correspond to the ten sefirot. The letter yud (י) is depicted by a point with a cusp at its head. The point-like nature of the yud corresponds to the sefirah of chochmah, which is likened to the initial spark, or point of potential through which a new insight enters reality. The cusp, or tip of the yud reaches upwards and alludes to the super-conscious root of chochmah, which resides in Keter. The first letter hei (ה) of the Tetragrammaton represents the expansion of the point of the 'yud' into all three spatial dimensions. This corresponds to the sefirah of Binah, which expands and develops the seminal point of wisdom (chochmah) into a detailed idea. The letter vav (ו) resembles a vertical line that connects the higher intellectual faculties with the emotive powers of the psyche. The gematria of the letter vav is 6, corresponding to the six emotive sefirot from loving-kindness to foundation. The final letter hei (ה) of the Tetragrammaton represents the sefirah of malchut. Isaac Luria reinterpreted and recast the whole scheme of Kabbalah in the 16th century, essentially making the second of two different versions of the Kabbalah: the Medieval (the initial, direct understandings of the Zohar, later synthesised by Moshe Cordovero) and the Lurianic. However, he understood his new doctrine as no more than a new revelation-teaching of the true meaning of the Zohar. Lurianic Kabbalah became the dominant Kabbalistic system, displacing Cordovero's, and afterwards the Zohar was read in its light. Lurianic Kabbalists sought to integrate this with the Cordoverian scheme, seeing both as true, but describing different aspects ("Worlds") of the Divine process. 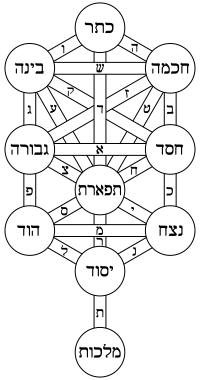 Medieval Kabbalah depicts a linear descending hierarchy of Divine vitality, the sefirot emerging from the Ein Sof to enact Creation. Lurianic Kabbalah describes enclothing processes of exile and redemption in the Divine flow, where higher levels descend into lower states, as souls to spiritual bodies. The first emanation in Creation leads to spiritual shattering of Divinity in a definitive "catastrophe" (Shevirat HaKeilim - "The Shattering of the Vessels"), and the exile of its "sparks" into the descending created realms. Cordovero had reconciled previous opinions of the sefirot by describing each as Divine Ohrot ("lights") invested in 10 spiritual Keilim ("vessels"), adapted by Luria to his scheme. In Lurianic Kabbalah, the first vessels of the sefirot shatter due to the sublime intensity of the light. Because each of the sefirot act as independent forces, Isaac Luria's attribution of the Iggulim (independent "Circles" arrangement of the sefirot) without cooperation, their immature vessels are weak. From the destruction of this primordial realm, the World of Tohu ("Chaos"), is built the subsequent World of Tikun ("Rectification"), characterized by lower lights and stronger vessels. The sublime lights of Tohu withdraw into the Ein Sof, while their sefirot vessels shatter down Creation. Sparks of the original high lights remain attached in exile to the descending fragments, and the Messianic task is the redemption of all the holy sparks of Tohu. In the World of Tikun in contrast, the sefirot vessels are mature, stronger and act together in harmony. To this reformed state, Isaac Luria attributed the former Kabbalistic concepts of Yosher (harmonised "Upright" arrangement of the sefirot), and the many Zoharic passages expounding the Partzufim (Divine "Personas/Configurations"-particular Divine manifestations). This systemised the classic concept of the Partzufim as the secondary, evolved arrangements of the sefirot in Creation. "In the beginning God created the Heavens and the Earth", the initial source in potential, from which all would unfold. "And the earth was Chaos (Tohu) and Void (Vohu), with darkness over the surface of the deep...", each sefirah acts independently causing the shattering (Shevirat HaKeilim). "...And God said let there be Light", the ability of the harmonised sefirot of Tikun to reveal Divinity and enact stable Creation. "These are the kings who reigned in the land of Edom before there reigned any king over the children of Israel..."
Edom is described in Genesis as the descendents of Esau. In the Kabbalistic scheme, this is identified with unrectified Gevurah - Severity, the source of the vessels of the World of Tohu - Chaos. The eight kings listed who reigned in Edom before any king of Israel, embodied the eight sefirot of Daat to Malchut in the World of Tohu, the vessels that shattered. Of each it says they lived and died, death connoting the soul-light of the sefirot ascending back to its source, while the body-vessel descends-shatters. Attached to the broken vessels are the holy residues of the former light as Nitzot - "Sparks" of holiness, sustaining Creation by the Divine flow of Will. The sparks are the creative force of the sefirot down the Four Worlds. The unabsorbed residue of the broken vessels in our physical, lowest World Assiah becomes the realm of Kelipot impurity. Genesis 1:2, "...And the Spirit of God hovered over the waters." Merachepet - "hovered" splits into the number "288 died", the root number of Divine sparks that then subdivide into innumerable fragments. The four realms of our created existence are together called the World of Tikkun ("Fixing"). In Tikkun, the sefirot evolve into new arrangements, where they can unite. The different realms Tikkun are characterized by lower lights and stronger vessels. As all levels of Creation are constructed around the 10 sefirot, their names in Kabbalah describe the particular role each plays in forming reality. These are the external dimensions of the sefirot, describing their functional roles in channelling the Divine, creative Ohr (Light) to all levels. As the sefirot are viewed to comprise both metaphorical "lights" and "vessels", their structural role describes the particular identity each sefirah possesses from its characteristic vessel. Underlying this functional structure of the sefirot, each one possesses a hidden, inner spiritual motivation that inspires its activity. This forms the particular characteristic of inner light within each sefirah. Chochmah-Insight of Wisdom Bittul – "Selflessness"
Tiferet-Beautiful harmony Rachamim – "Mercy/Compassion"
World of Emanation (Hebrew: אֲצִילוּת‎, Atzilut): In this level the light of the Ein Sof radiates and is united with its source. Divine Chochmah, the limitless flash of wisdom beyond grasp, predominates. World of Creation (Hebrew: בְּרִיאָה or alternatively בְּרִיָּה‎, Beri'ah): In this level, is the first creation ex nihilo, where the souls and angels have self-awareness, but without form. Divine Binah, the intellectual understanding, predominates. World of Formation (Hebrew: יְצִירָה‎, Yetzirah): On this level, creation is related to form. The Divine emotional sefirot of Chesed to Yesod predominate. World of Action (Hebrew: עֲשִׂיָּה‎, Assiah): On this level creation is relegated to its physical aspect, the only physical realm and the lowest World, this realm with all its creatures. The Divine Kingship of Malchut predominates, the purpose of Creation. In the Zohar and elsewhere, there are these four Worlds or planes of existence. In the Lurianic system of Kabbalah, five Worlds are counted, comprising these and a higher, fifth plane, Adam Kadmon-manifest Godhead level[clarification needed], that mediates between the Ein Sof and the four lower Worlds. As the four Worlds link the Infinite with this realm, they also enable the soul to ascend in devotion or mystical states, towards the Divine. Each World can be understood as descriptive of dimensional levels of intentionality related to the natural human "desire to receive", and a method for the soul's progress upward toward unity with or return to the Creator. (The terminology of this formulation is based on the exposition of Lurianic Kabbalah by the 20th century Kabbalist Yehuda Ashlag). Kether heads the central column of the tree, which is known metaphorically speaking as the "Pillar of Mildness" and is associated with Hebrew letter Aleph, "the breath", and the air element. It is a neutral one, a balance between the two opposing forces of male and female tendencies. Some teachings describe the sefirot on the centre pillar as gender-neutral, while others say that the sefirot vary in their sexual attributions. The left column is headed by Binah and is called the "Pillar of Severity." It is associated with Hebrew letter Mem, the water element and the female aspect. While the pillars are each given a sexual attribution, this does not mean that every sefirah on a given pillar has the same sexual attribution as the pillar on which they sit. In Jewish Kabbalah, of all the sefirot only Binah and Malkuth are considered female, while all the other sefirot are male. Additionally (and this applies to both Jewish and Hermetic Kabbalah), each sefirah is seen as male in relation to the following sefirah in succession on the tree, and female in relation to the foregoing sefirah. Alternative traditions consider the grammatical genders of the words involved. Thus, Gevurah is feminine because it has an atonal finial Heh. Thus, Severity or Justice becomes a feminine attribute while Chesed (Mercy or Loving-kindness) becomes a masculine one, despite the modern Western tendency to genderize these terms in reverse manner. In a numerological sense, the tree of sefirot also has significance. Between the 10 sefirot run 22 channels or paths which connect them, a number which can be associated with the 22 letters of the Hebrew alphabet. Together the spiritual forces of the 10 sefirot and the 22 connecting channels are called the "32 Paths of Wisdom". As for the 22 letter-paths, there must first be an explanation of the three different types of letters in Hebrew. There are three “Mothers” (Aleph, Mem, and Shin) that represent the horizontal lines. Their difference from the other letters is a matter for another article. There are seven “Doubles” (Bet, Gimel, Dalet, Kaf, Peh, Resh, and Tav) that represent the vertical lines. Each double is attributed to a soft and hard sound, positive and negative meaning, direction, planet, gate of the soul, color, angels, and vowel. Gimel, Dalet, Resh, and Tav’s second pronunciations are lost or disputed, with different dialects using different sounds. Tav has no second pronunciation in Sephardi, but Ashkenazi use a 's' sound when the dagesh is absent. The twelve “Elementals” (Heh, Vav, Zayin, Chet, Tet, Yud, Lamed, Nun, Samech, Ayin, Tzaddi, and Qof) have one pronunciation, and represent the diagonal lines. Other sources say that they correspond to the twelve zodiacal constellations. The Mothers represent the three times Genesis states “God made." The Doubles represent the seven times Genesis states “God saw." The elementals (or singles) represent the rest of the times “God” (Elohim in every instance of Genesis Chapter 1) is mentioned. Bible code, a purported set of secret messages encoded within the Torah. Chol HaMoed, the intermediate days during Passover and Sukkot. Gematria, Jewish system of assigning numerical value to a word or phrase. Lag BaOmer, 33rd day of counting the Omer. Notarikon, a method of deriving a word by using each of its initial letters. Weekly Torah portion, division of the Torah into 54 portions. ^ a b c d e f g h i Ginsburgh, Rabbi Yitzchak (2006). What You Need to Know about Kabbalah. Jerusalem: Gal Einai Institute. ISBN 965-7146-119. ^ a b Cohn-Sherbok, Dan. Kabbalah and Jewish Mysticism: An Introductory Anthology. One World Oxford. p. 9. ^ The Song of the Soul, Yechiel Bar-Lev, p. 73, cited on Kabbalah page. ^ See the discourse "On the Essence of Chassidus", Kehot Publication Society, described on the Hasidic philosophy page. The acronym "RADLA" for this level is identified as the origin of the Torah of Hasidus. ^ Ginsburgh, Rabbi Yitzchak (2007). Kabbalah and Meditation for the Nations. Canada and Israel: Gal Einai. ISBN 965-7146-127. ^ See for example the classic passage from the Zohar beginning "Elijah opened his discourse.." that is read every Friday afternoon to prepare for the Sabbath, in the Habad Siddur "Tehillat HaShem". ^ P. 23, Kaplan, Aryeh (1990). Sefer Yetzirah: The Book of Creation. York Beach, Maine: Samuel Weiser. ISBN 0-87728-726-0. ^ Cohn-Sherbok, Dan. Kabbalah and Jewish Mysticism: An Introductory Anthology. One World Oxford. p. 10. ^ Mystical Concepts in Chassidism, Jacob Immanuel Schochet, Kehot, Chaptor 1, "Anthropomorphism and Metaphors"
^ Rabbi David Seidenberg (2004). "The One-Page Save-The-Trees Tu Bish'vat Haggadah" (PDF). Archived from the original (PDF) on 2010-07-29. Retrieved 2014-03-11. This page was last edited on 16 April 2019, at 12:23 (UTC).